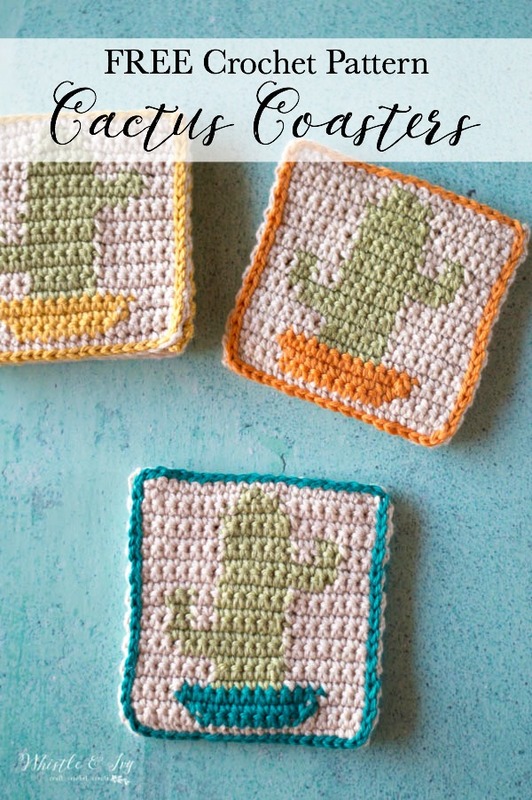 These darling and trendy crochet cactus posters use simple color changes to make the fun cactus print! The post also includes a video that show how to read a graph and how to change colors. The post has contains affiliate links which means I get a small commission (at no cost to you) if you make a purchase with one my links! Thanks for supporting Whistle and Ivy! I have been itching to get outside in my garden. We had some beautiful days this week, but spring is a fickle creature; one day it will be 72º and the next will be 40º. Yikes! 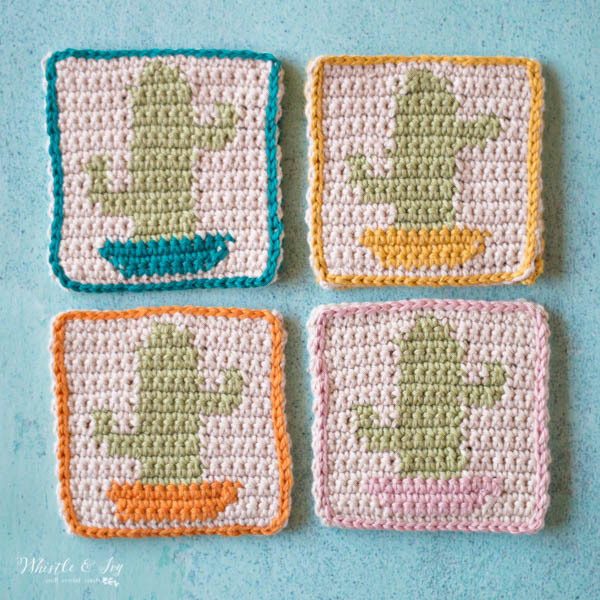 So this weekend I spent my time designing these simply adorable crochet cactus coasters, because I am hoping the beautiful spring weather is around the corner and will plan to stay awhile. Aren’t they darling? Ever since I starting dabbling in colorwork with my Neva Hat, I have been having the most wonderful crochet colorwork ideas. It’s fun how these little coasters work up quite fast. I made mine almost entirely in the car this weekend as we took a short trip out of town with our kids. 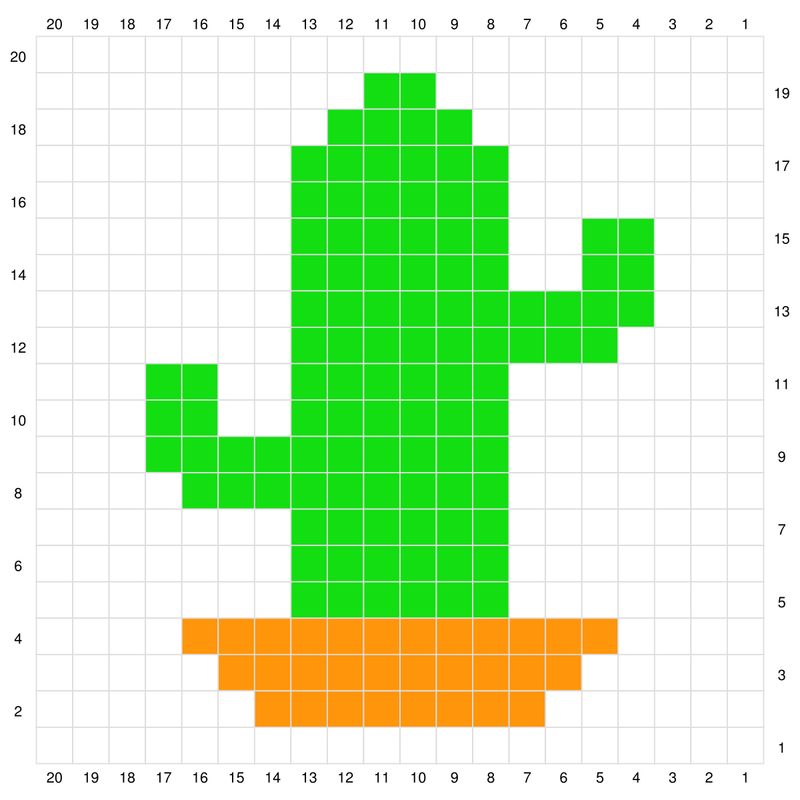 The graph is fairly simple and after you make two you might be able to finished your cactus coaster set without the graph! I always recommend using 100% cotton or a cotton blend yarn with any crochet project that might get wet. I used one of my favorite cotton yarns, Comfy, for this project. The colors were perfect and the yarn is so smooth. The small amount of acrylic gives it a soft feel, but it’s absorbent like 100% cotton, so I love it for coasters and washcloths. Graph Notes: You will carry the ivory through each row, but drop the other colors and pick them up when you come back to them on the next row. Because you are turning, the graph is numbered according to which side you should begin with. For instance, row 4 would be worked right to left as always, but you will read the graph from left to right, in order to complete the graph correctly. 2. – 20. Complete the graph, treating each square as 1 sc. Turn after each row. Note: Work an extra row on the back piece because changing colors causes the graph piece to be slightly taller than a back piece worked with 20 rows. Using the loop from the last stitch of the back piece, slip stitch all around the coaster, sewing the two pieces together. 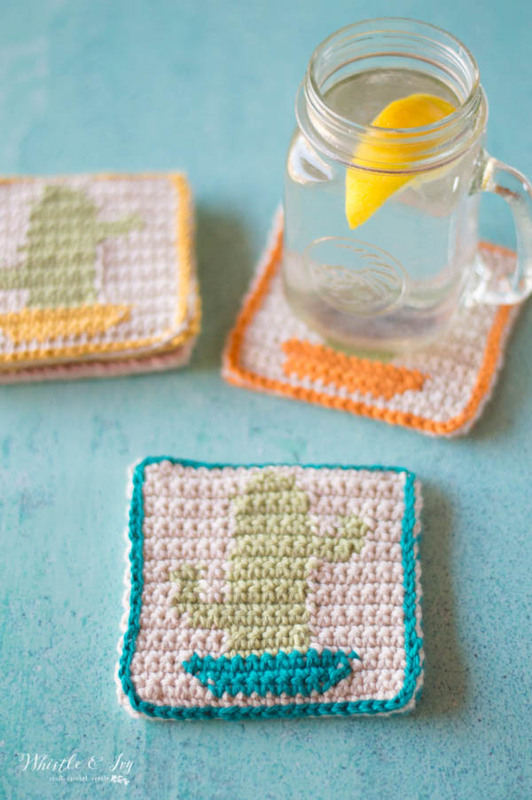 Love these crochet cactus coasters? Subscribe! First, thank you for the cactus pattern. 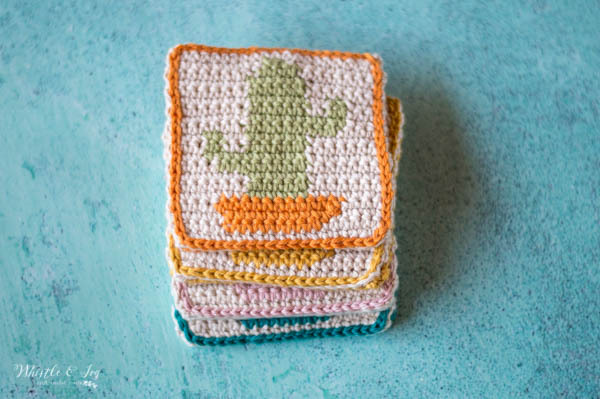 Our theme is Southwestern so after I make the coasters I am going to make your pillow as well. I do have a question about the coasters. I am almost finished with the front of the first one and it is 6″ wide. I am using 100% cotton and working tight stitches. Will that change once I attach the back to it? It just seems really huge. That’s quite big! You may need to go down a few hooks sizes. They should only be about 4″ wide. I may need to add some gauge information, I am sorry. What yarn are you using? 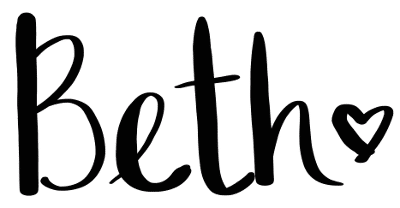 Beth, I’m wishing you all the best of everything! (((Hugs!!!))) Love your patterns, and love the direction you’re about to take! I am a newbie at crocheting, but I do like reading about you and your family , I love your patterns, thanks so much for taking your time to share with us. These are so cute. I love your Blog your a very Talented lady. Thanks so much! Sending virtual hugs and mental good vibes your way! Here is your virtual hug you requested. I totally enjoy reading about your everyday life as well and both FPF and the patterns you have for sell. Feedback is important and I believe every designer/blogger deserves to hear from his/her readers. Count me in as a 100% fan! I don’t mind you changing anything. Family always comes first! I enjoy reading things you post and also your caring about your “tribe”. I’m here cuz I want too & and not just for the free stuff. Here is your virtual hug🤗🤗🤗🤗🤗🤗 ..Have a blessed day! I look forward to seeing the stuff that you post. 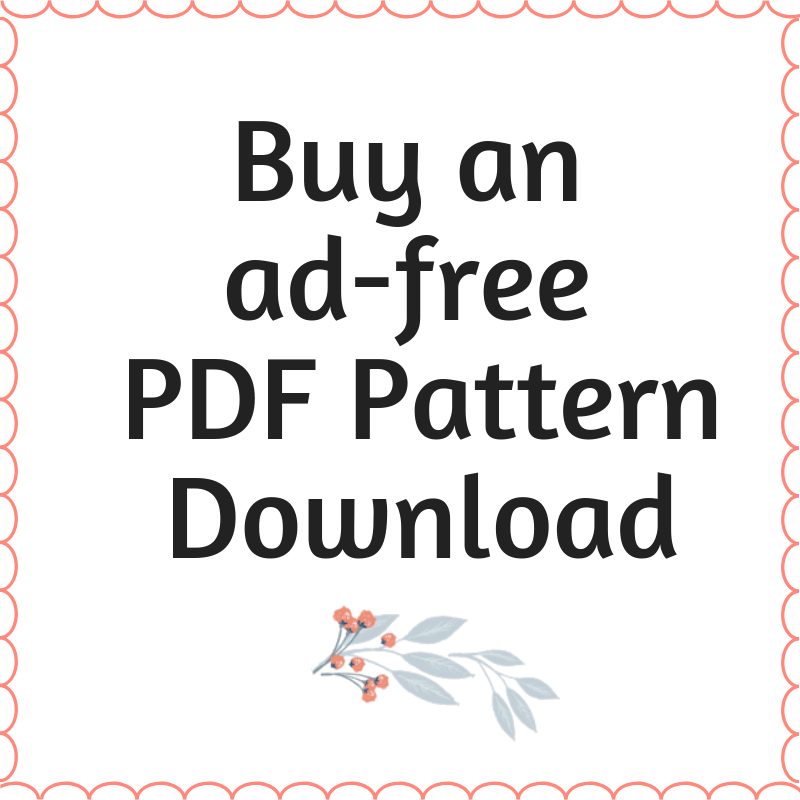 You also have the best patterns….ones that I like to crochet. So with that being said please leave me on your mailing list. Looking forward to your posts and bnb patterns. Thank you so much! I love this coaster. I collect cactus. Thanks so much for the pattern. I love your work. Thank you so much, I love your patterns. I enjoy reading about your family. I think it makes us all realize that we are not alone. Have a wonderful evening. I love you sharing your love of crochet with me, and sharing your family too. I have been crocheting for many years, but I can always appreciate what someone else is doing. Thanks for your generosity. 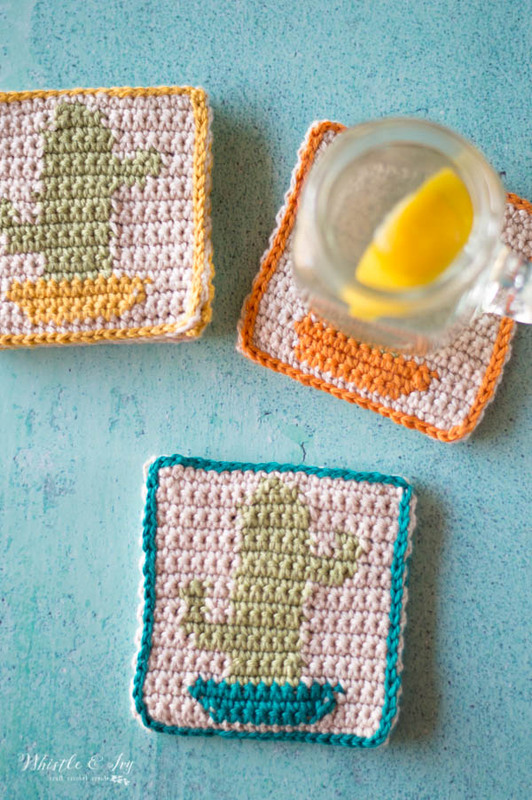 Living in the desert southwest, these will make very spot-on coasters for gifts !!! Thanks for the free gift ~ Love them !!! Very nice. I quite enjoy your blog !! Hugs to you. My crochet stash is hugh, but I am always looking for new, different patterns. You can either work the pattern as is (the arms will just be opposite sides) or you can work the chart from left to right. Ooo, i love these. I have some bits of left over yarn in suitable colours, I’m gong to give these a try. Thanks. These are adorable! I love cactuses too! Thanks so much for this pattern. Thanks so much, Annie! You are welcome!